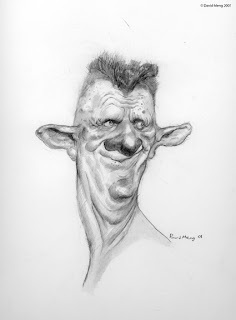 David Meng Art: "Another Oldie"
New Zealanders tell me the face on this one fits their stereotype of an Australian. Australians, what do you think? It was actually based on a friend who is an American. It's another drawing from way back, when I was still but a lad. Now that's a fucken aussie if ever there was one. Hope you're doing well J, great to hear from you. p.s. sorry it took so long to respond. No its just a new zealand stereotype of an aussie afraid david, mainly from parochialism.